The candidates for City Council have been showing up in various venues and forums that give us an opportunity to learn about them and their positions. This series is intended to provide a comprehensive resource (including links to other coverage) to learn about and consider the positions of the candidates for the 33rd and 39th Council Districts with respect to development, and particularly the emblematic touchstone of Atlantic Yards. We will provide the candidates’ positions on development and Atlantic Yards in their own words, together with commentary of our own respecting Atlantic Yards. We will also provide, as a comparative reference, the positions of the two current City Council office holders, David Yassky and Bill de Blasio, whom the candidates are seeking to replace. We expect to supplement what we do here with future pieces similarly covering the positions of candidates running for other City Council seats and also those running for city-wide positions. In certain cases we have had conversations following up on candidate’s positions where it seemed particularly helpful to provide an overview. The first part of this series will examine the exceptional importance of development issues to the City Council races and the kind of coverage these issues are getting and which is possible. The second part of the series will inventory the positions of the candidates for the 33rd City Council District, while the third part will inventory the position of the candidates for the 39th. Overall, we will keep returning to the question of what we should be looking for from political office-holders in terms of effective action to stop Atlantic Yards. This series reviews the positions of fifteen candidates in the current political race. They unanimously oppose Atlantic Yards. It seems as if the only remaining question is how they will be effective in stopping the project. What we care about here at Noticing New York, what we focus on, is the city-shaping development that is going on in New York. We therefore find ourselves writing an extraordinary amount about politics. Often when you look at a project, especially some of the megaprojects currently fashionable under the Bloomberg administration, Atlantic Yards being the perfect example, they look less like true development projects than like what they actually are: The result of the abuse of politics to package and deliver benefit at taxpayer and community expense to a connected crony. In the case of Atlantic Yards, that crony is wealthy, subsidy-collector and sports team owner Bruce Ratner of Forest City Ratner. The question then is: When you see this kind of abuse, what do you do about it? We’ll come back to that. It’s an important part of our theme. As we noted in or introduction, none of the candidates (or those whom they will succeed) purport to like Atlantic Yards. Before anything else, we should take note of the coverage of the candidates’ thinking that has already occurred. While the candidates running to replace City Councilman David Yassky (33rd District) may not differ as much on substance as they conceivably might, the candidate forum evening could hardly be considered a “yawn” given the candidates’ pretty much universal objections to the current administration’s development policies and big project initiatives. Isn’t Bloomberg’s ability to create such unity a fascination in itself? 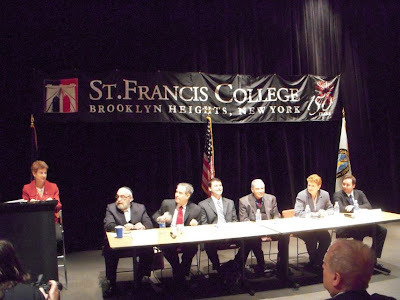 The candidates were nearly unanimous in opposing; Atlantic Yards as the worst, most destructive project in Brooklyn, opposing housing in Brooklyn Bridge Park, opposing the Walentas Dock Street project near the Brooklyn Bridge, wanting a federal superfund clean-up of the Gowanus Canal and in calling for stronger community boards and a stronger City Council. How can such clearly marshaled opposition to the status quo be boring? Or is the Brooklyn Paper’s message simply this: Strong opposition realistically means nothing because: 1.) the office of the mayor is supreme over the City Council, and 2.) Bloomberg’s claim to the mayoralty is not subject to practical political challenge? The night of the forum was a rainy one. It would be a pity if those who did not make it to the St. Francis auditorium the night of the hearing gleaned an impression from the Brooklyn Paper that it was worthless. We think the fictionalized “Politicrasher” who wrote about the night at St. Francis (a self-described “grizzled old newshound”) is actually the paper’s editor, Gersh Kuntzman, since 1.) he was there covering the event for the paper, 2.) it seems to be his style, and 3.) the byline cartoon even looks a little like Gersh. We weren’t there on April 25th to be able to give our own view but we suggest that you contrast the Brooklyn Paper’s listless disenchantment with the way Only The Blog Knows Brooklyn’s begins its coverage of the same forum: “Who knew politics could be such fun?” (See: Monday, April 27, 2009, City Council Candidates Try to Dazzle in the 39th District.) For other coverage from someone who found themselves more engaged (with some nice photos of the candidates) see Pardon Me For Asking’s: Saturday, April 25, 2009, 39th Council District Candidates Submit To Tough Questioning At 'Dazzle Me' Forum. We note that the Brooklyn Paper historically has defined itself by imbibing much of its energy from coverage of local development. Historically, its reporting reflected a healthy skepticism of big development and a corresponding sensitivity to community concerns. Given a history of what was once the Brooklyn Paper’s vigorous opposition to Atlantic Yards (Wednesday, February 11, 2009, A Brooklyn Paper Editorial & Atlantic Yards: With Nothing Else Good To Say, We Are Stimulated To Say. . .) would it not be natural to expect that the Brooklyn Paper would seek to be alert, as we try to be, to the “anti-development” fertile ground whence will come defeats of the Bloombergian development tide with the demise of Atlantic Yards, et al. And from a development standpoint aren’t City Council races important to watch given the notorious amount of developer campaign contributions that go into them? Whether the Gowanus Canal should be cleaned by being designated as a federal Superfund site is a hot topic and hard to avoid in what we are talking about. Now is probably an excellent time to get into it. Because is a major current topic it allows us to reflect a bit more about what Brooklyn Paper is currently doing. We have noticed that most of the public is quickly embracing the idea of a Superfund clean-up of the Gowanus because that would likely result in the most thorough clean-up of the Gowanus but the Brooklyn Paper had been quick into the breach with what looks like support for those who would like to eventually fall in line behind Bloomberg. It is clear that the city’s plan, which does not involve a full, deep dredging of the contaminated sediment out of the Gowanus, would not clean up the Gowanus to the fullest possible extent. We doubt that a shallow dredging of the Gowanus, followed by the overlay of a clean sand cap on the contaminated muck, is a desirable strategy for a storm surge area. We are definitely inclined to favor a more thorough approach to clean-up and therefore probably the Superfund designation. We are not sure why the mayor’s office is not proposing a more extensive clean-up that includes a deep dredging. We also discount the idea, promoted by the Toll Brothers developers and the Bloomberg administration, that the reason not to designate the Gowanus as a Superfund site is that the “naming” of it as a Superfund will somehow hurt the brand when they market the real estate. To borrow back terminology from the Wall Street financial crisis, everyone knows that the Gowanus is a “toxic asset” and rebranding it as “legacy asset” won’t change anything. The strategy of those keeping open their Gowanus options for an ultimate shift to back Bloomberg seems reminiscent of the oil companies’ fight to stave off environmentalists and science community Cassandras on the subject of global warming: Rather than start by zeroing on the basics of what is likely needed, they first sell the idea of uncertainty and then promote inertia by directing people’s focus to their short-term comfort. If the city can, by similar means, fend off a superfunding of the site and if it thereafter becomes safe for a certain set of politicians to fall in line behind Bloomberg, the city can thereupon figure out how much less of clean-up of the site it can get away with. This analysis does not amount to our actual endorsement of superfunding the Gowanus. That is something about which we are still doing more research, but it comes close to such a recommendation on our part. How dangerous is the canal? We know we wouldn’t want to go swimming in it, thanks to those noxious chemicals in the sediment, but is the canal unsafe to be around? . . . cancer or illness . . In short, does the Gowanus Canal represent an actual health threat beyond its stinkiness after heavy rains? And finally, who will pick up the tab? Last week, we learned that municipalities are often holding the bag — which would put city taxpayers right where we started. For a better report on the April 20, 2009 city council candidates forum for the 33rd district (Yassky’s current seat) focusing on things particularly with respect to Atlantic Yards, see Atlantic Yards Report: Thursday, April 23, 2009, Looking at the 33rd district race, AY, and some undercurrents. Here also is an audio recording of the evening posted by NNY. We ourselves thought that the main story of the April 20th forum was how development issues predominated during the evening. Not only did development issues, including Atlantic Yards, come up importantly in the candidates’ self introductions and their summing up at evening’s end, but the audience questions predominantly focused on development issues, evoking a remarkable degree of consensus on how city development policies have gone astray. During the evening the candidates responded to 11 audience questions and only two of those questions, one on gay marriage and one on mayoral control of public schools, did not involve development issues in a significant way. (Development aside, the mayor also does not seem to be winning points on his handling of the schools.) There was one question very important to issues of how future development proceeds in the city that was not directly about development: All the candidates agreed that Bloomberg’s extension of term limits to procure himself a third term was wrong. If Bloomberg receives a third term it could be critical to projects like Atlantic Yards which depend significantly on the mayor’s stubborn determination to override the community and what makes sense to other politicians. This aligns with a related theme of the evening: that there should be greater power outside the mayor’s office. The candidates all felt that community boards should be more empowered than they currently are, including receiving more technical assistance and resources to be involved in planning. In this regard, Ken Baer mentioned the purge of Community board 6 by Borough President Marty Markowitz after its board members voted their consciences to oppose Atlantic Yards. Issac Abraham similarly noted that the appointment of community board members by elected officials was a problem. The candidates also favored a stronger City Council that would adhere to principles and conscience and respect the will of the community by taking on the people in power. For Jo Anne Simon this meant the council working together, not with developers. This came up in the context of a question that asked whether the candidate, if elected, would follow a tradition that City Council members usually vote on local land use issues following the lead of the council members from the local community involved. It may be counterintuitive to understand, but that can lead to many situations where council members vote against their principles, against their conscience, and, ironically, against the community. The example given in the question being responded to was the controversial 125th Street rezoning and Columbia’s expansion into West Harlem (abusing eminent domain for real estate profit). Isaac Abraham pointed out that part of the problem is that the mayor has too much control over individual local city members. (This means the mayor can exert controls over development votes by pressuring individual City Council members to vote against their constituencies. Abraham mentioned as an example that the mayor’s taking away parking privileges when city council members don’t vote his way. This is about the culture of the New York City Council. The mayor and the speaker have a tight grip on the city council members. We saw that in the term limit extension vote. We know that the speaker does not allow bills on the floor that she does not approve of. But not only that, there is an expectation that the council will follow the lead of the local council person on development and other issues in the neighborhood that pertain to the council member’s district. For example, when Robert Jackson and Inez Dickens supported the rezoning of 125th Street or the expansion of Columbia University into Harlem, then almost every other council member votes the way Jackson and Dickens had led, even as some of those council members state they vehemently oppose the planned use of eminent domain for private gain. The question here is how do you see yourself acting differently as a new council member. Should you be able to challenge the climate of going along to get along that exists right now in the council? Would you fear retaliation if an issue came up in your district if you oppose the local council member? Regarding the “tight grip” of the City Council Speaker Christine Quinn referred to in the question, Ken Diamondstone suggested that electing the proper speaker (presumably not Ms. Quinn) was key. 2. Opposition to Dock Street Tower Proposed to Obstruct the Brooklyn Bridge. The candidates unanimously opposed the Bloomberg administration’s Dock Street project which will soon be up for a City Council vote. (It has already gone through City Planning.- See: Sunday, April 26, 2009, Markowitz, McCullough, Me and Other Merry Minions of the Blogosphere.) Ken Diamondstone made the essential point that we made about the city administration’s abuse of process by “bundling” the project together with the community’s ability to get a school. This means the community will get a project that it doesn’t want together with a school in the wrong place and whose design won’t work well into the bargain. (See: Saturday, March 14, 2009, At the City Planning Commission Hearings on Proposed Dock Street Project: A Reprise.) If you were a reader of the Brooklyn Paper’s story covering the evening’s forum you would find that Mr. Diamondstone was mocked for his position. The “Politicrasher”managed to do this by misquoting Mr. Diamondstone. Although what Mr. Diamondstone said at that moment was not phrased with particular eloquence, we do not think the paper’s “quote” was a fair representation of what he said. We went back and listened to the recording. The Brooklyn Paper is in an odd position on Dock Street: They editorially support the project (its developer was their landlord when they took that position) but they are reporting on the investigation of the scandal involving administrative arrangements whereby the School Construction Authority colluded with the developer to bundle the project with the school. On the topic of development. Under Mayor Bloomberg we have seen many developer-driven projects in New York City. Many of those projects include the threat or use of eminent domain. The question is: How do you envision the community role in development? Are you willing to fight for the communities against the developers? What tools would you use to fight for the community? Mr. Baer talked about fighting vigorously against Atlantic Yards and getting the Sierra Club to join the opposition’s law suit. Doug Biviano talked about the evil of eminent domain used for the wrong purposes and Atlantic Yards in particular. He talked about taking the initiative by getting out in front with the press. Ken Diamondstone similarly talked about exposing wrongs and the collusion with respect to Atlantic Yards, and ensuring community involvement. Evan Thies talked about the problems with the (careless?) “ready-aim-fire” style of Bloomberg’s development approach, and spoke of 360 degree community development planning and using skills he had developed to stop a project in Red Hook. Isaac Abraham did not mention Atlantic Yards. Interestingly Jo Anne Simon also did not mention Atlantic Yards by name. In fact, rather than speak in term of fighting against projects being thrust upon the community by the Bloomberg administration, Ms. Simon spoke in positive terms of fighting for the origination of future projects through community planning. Without mentioning Atlantic Yards directly; however Ms. Simon did speak of how we have given too much authority to public authorities which desperately need to be reformed and desperately need transparency. Though she did not thereby mention Atlantic Yards directly, for those familiar, her words evoked the Brooklyn Speaks coalition’s approach to Atlantic Yards which has focused on reforms to curb the misbehavior of the Empire State Development Corporation which, it is supposed, would indirectly improve the project. The “mend-it-don’t-end-it” shorthand has been used to describe Brooklyn Speaks. Ms. Simon objects to that shorthand. What Brooklyn project is the biggest boondoggle and the most destructive to the city and borough and what would you do to take effective action to stop that project? One would think that the first part of that question would be a softball. Of course, having answered it, the second part of the question respecting “effective action” is the more difficult. Because it is the difficult part of the question, it is the more important and the most likely to distinguish the candidates. We will give it the most ink before we conclude. A matter of disclosure: The card with the above question on it was submitted by us. To our surprise, Ms. Simon said she could not identify the biggest boondoggle project in the borough. She did say that it was hard to know which project was because “we don’t have good numbers, Atlantic Yards being an example.” She spoke about how “a lot of this has been speculative assumptions.” She also mentioned that “single site control is an issue respecting a lot of these projects.” If she is speaking of Atlantic Yards in this regard (and she should be), she would be a step ahead of Brooklyn Speaks. Brooklyn Speaks should be (but is not yet) calling for breaking up the Atlantic Yards site and the use of multiple developers to develop a reconstituted, redesigned project. But if the effective action she is thinking of is reform of ULURP as Ms. Simon mentioned that is a rather late after-the-fact proposal which would not stop Atlantic Yards or any project so similarly far along that it needs to be stopped. I would have to say Atlantic Yards as well just because of the sheer size and cost of the project. I know it was a Brooklyn question, but the baseball stadiums are just an incredible waste of taxpayer money. I love baseball. I love it. I love going to watch the Yankees and the Mets but we could close the budget deficit with the amount of money we spent on those things. (But I am sure the $20 sushi is great.) On Atlantic Yards, it’s an example of everything that the city and state do wrong with development: There’s no real community process; they didn’t really do any real evaluation of infrastructure, as Ken said, and we spend millions and millions of dollars and get absolutely nothing for it. It is a gaping monument to how bad the city and state have gotten at these developments and how nearsighted they are. We should get that money back, by the way, along with the money we gave to the Yankees and the Mets, and spend it on something we need such as real affordable housing. I hope that eventually we will develop something on that site that does create the jobs that they promised but also creates affordable housing at a reasonable size. Evan Thies had the most knowledgeable and detailed answer on the subject of regulated units, getting into a discussion of the affordable units created by inclusionary zoning programs. This is not to say we agree with his conclusions but they would provide the basis for a good discussion. This seems to have contributed to the Brooklyn Paper saying he “came off as the wonkiest of the bunch.” If so, we consider wonky a good thing and we would probably also give credit to lawyer Jo Anne Simon’s capability for a fair amount of wonkiness even though the paper did not give her stars in this regard. Almost all the summing up for the evening emphasized standing up for the community against the powers that be. Ms. Simon said that she was the one to vote for “if you believe that community voices need to be heard.” Ken Diamondstone spoke about the problems with the power structure of the Democratic party, saying that support for reform and for Assemblyman Vito Lopez didn’t go together and that community had to be put first. Doug Biviano called for protecting communities and courageous leadership at the local level. Ken Baer spoke of the need for transparency and standing up to power and objecting to things like the mayor’s term limits extension. Isaac Abraham complained about the misdirection of public funds. Evan Thies spoke about how the city wastes funds on projects like Atlantic Yards and how now is the time for leaders to come forward who can be effective in City Council. We’d like to think that means recapturing those Atlantic Yards moneys as Evan spoke of. More on this later. That then is our report of the St. Francis evening. It is less quippy and zippy than the Brooklyn Paper’s account. In fact, it probably sounds like an entirely different evening. We hope it gives you a better feel for the issues being discussed. In Parts II and III we will look more at the candidates’ positions on development and Atlantic Yards.